These strategies can help get kids to eat more plant foods at every meal—even at snack time. Parents of children who like to eat a variety of plant foods usually don’t worry about whether they’re meeting their recommended daily servings. But parents whose kids snub their noses at these foods often grapple with daily mealtime struggles. However, the benefits of eating more plant foods beginning in early childhood are plentiful. Fruits, vegetables, legumes, and whole grains contain fewer calories than many processed foods and are abundant in phytochemicals, fiber, vitamins, and minerals. The following is a discussion about the benefits of eating plant foods beginning in early childhood as well as strategies to help parents encourage children to embrace them at every meal and even during snack times. Children are more likely to practice healthful habits in adulthood if they learn them at an early age. According to research in the area of epigenetics, what children eat early in life has a lasting impact on their genes and their risk of developing obesity and chronic disease.3,4 Epigenetics is an emerging field of study that focuses on how outside factors such as food and the environment influence gene expression (ie, how genes are turned on or off).5 For example, a study that used DNA methylation status (an epigenetic indicator) to relate maternal pregnancy diet and children’s adiposity at age 9 found that the amount of carbohydrate in the prenatal diet played a considerable role in future metabolic disease risk.3 The mechanisms by which nutrition-induced changes in the epigenome occur continue to be elucidated in ongoing research. It’s important for clients with young children to know that plant foods naturally are low in calories. Bite for bite, children consume fewer calories from plant foods than from calorically dense processed foods such as potato chips, crackers, cookies, and baked goods. Plus, since plant foods boost satiety, kids will feel fuller faster and longer, and they will be less likely to snack on unhealthful items throughout the day. What’s more, high-fat, processed foods can contribute to obesity and set children up for serious diseases later in life, such as fatty-liver disease, type 2 diabetes, and cancer.6,7 The other benefits of plant foods are that they contain phytochemicals, fiber, and various vitamins and minerals for optimal childhood development. Fruits, vegetables, whole grains, and beans contain plentiful amounts of fiber, and therefore can produce healthful gut bacteria and protect against colon cancer.18,19 Fiber plus adequate hydration helps prevent constipation, which can contribute to gastrointestinal distress in children. In addition, fiber-rich whole grains, such as oatmeal, keep children’s blood sugar more stable and provides a consistent fuel source for their brains, helping them to focus better in school and improve their performance.22 Whole grains also provide vitamins and minerals that are lost in the refining process. • Vitamin E: protects against cardiovascular disease and cancer; found in almonds, hazelnuts, peanuts, and avocados. • Shop with the kids. Suggest clients take their children to the grocery store and have them choose fruits and vegetables they’d like to eat. When they select the foods themselves, they’re more likely to eat them. • Visit a local farmers’ market. Introducing kids to farmers and letting them choose which produce they want to take home can get children excited about trying fruits and vegetables they’ve never eaten before. Recommend parents ask the farmers whether the family can visit the farm to see where the foods are grown to increase children’s appreciation for fruits and vegetables. • Involve the kids in food preparation. Children are more excited to eat a food if they helped prepare it. For instance, recommend that parents help their kids make their own pizzas with whole wheat crust and offer healthful toppings, such as mushrooms, peppers, zucchini, and spinach. “The benefits of cooking with kids are numerous, including increased consumption of fruits and vegetables; greater willingness of children to try new foods; parents and children spending quality time together; less time spent in front of the TV or video games; reiteration of math, science, and reading skills; and greater likelihood of family meals,” says Jessica Levinson, MS, RD, CDN, founder of Nutritioulicious, a nutrition consulting and counseling practice in the New York area. • Share in the decision making. While parents should be encouraged to decide where and when the family will eat and what foods to offer, suggest they allow their children to decide which vegetables to eat from the variety offered and how much. When children feel they have some control over the situation, they’re more likely to eat the vegetables they choose, thereby increasing their plant-food consumption. • Emphasize plant foods as time-savers. Plant foods can be easier to make because many don’t require much preparation or cooking. For example, clients can cook a white or sweet potato in the microwave and top it with canned beans, ready-made salsa, or shredded cheese for an easy meal. They can buy ready-to-eat carrots, prewashed greens, celery, oranges, or apples as grab-and-go snacks. • Buy frozen veggies. Frozen vegetables already are cleaned and cut, which reduces food prep and cleanup time, and they’re always available in a pinch, making it easier for parents to get them on the table. Suggest clients choose frozen vegetables without added salt to reduce sodium intake. If they’re buying a vegetable that comes in a sauce, complement it with another vegetable without sauce or added salt. Some people believe frozen vegetables aren’t as healthful as fresh ones, but this isn’t necessarily true. Most frozen vegetables are flash frozen soon after they’re picked, which helps retain most of the nutrients.25 Fresh vegetables can take time to get from the farm to the grocery store to the table, leaving them vulnerable to light and air exposure, which can reduce some of the nutrients.26 Fresh vegetables always are a great option, but the frozen varieties are convenient, available year-round, and promote good health. • Microwave frozen packs of brown rice or quinoa. These whole grains can be ready in as little as one minute. Another option is preparing quick-cooking brown rice that can be ready in 10 to 15 minutes. • Make popcorn. Suggest parents get their children involved and make popcorn from scratch. Recommend they lightly spray the popcorn with cooking oil spray instead of butter before salting. Or suggest they sprinkle it with cinnamon and a small amount of sugar or spices. • Prepare soba noodles. If their children like semolina pasta, recommend parents substitute soba noodles made from the whole grain buckwheat. Choosing this whole grain will add various vitamins and minerals to their children’s diets and increase their fiber intake. • Purchase whole wheat snacks. Teach clients to look for specific phrases, such as “whole wheat,” “whole grain flour,” “whole oats,” or “brown rice,” at the beginning of the ingredient list when buying grain products. Explain that the terms “wheat flour” or “enriched flour” doesn’t mean whole grain, and neither does the phrase “made with whole grains,” which is a marketing tactic. Recommend parents buy snacks with 2 g or more of fiber per 1-oz serving. • Eat more beans. Tell clients that black beans and pinto beans can be the star ingredients of a make-your-own-taco or make-your-own-burrito meal along with their favorite veggies. Parents can throw beans in a blender with their favorite seasonings for a quick homemade dip. They can make various bean salads and soups as well as beans and rice side dishes. Suggest clients allow their children to select a new bean to try at the grocery store, such as aduki or mung beans. • Consider tofu or tempeh. These soy-based products take on the flavors of whatever they’re cooked with, so suggest clients prepare a vegetable stir-fry or chili made with tofu instead of meat. Encourage them to explore new recipes with their children, such as pressed tofu cooked in ginger, garlic, agave, soy sauce, and balsamic vinegar. Clients can serve tofu hot or cold as a snack in place of cheese. Young children can eat tofu plain in bite-size pieces. • Snack on nuts. Nuts can be a good source of polyunsaturated fatty acids as well as magnesium, potassium, fiber, and the antioxidant selenium. Dry-roasted almonds and cashews are popular, but for variety clients can expand to walnuts, macadamia nuts, and Brazil nuts. Clients should let their children choose a new type of nut and explore new tastes together. Nuts can make their own tasty snack, be used as a salad topper, or be eaten as a nut butter on whole grain toast. • Cook two to three meatless dinners per week. Recommend clients replace meat with plant-based protein and whole grains such as beans, quinoa, amaranth, and lentils to boost their fiber and phytochemical intake. • Use hunger as an opportunity. When kids are hungry, they’re more likely to try something new, so recommend clients introduce new, healthful foods at the beginning of mealtime. Serve fresh-cut veggies as an appetizer before the main course along with the kids’ favorite dip.27 Let them experiment with herbs and spices and smell, taste, and explore different combinations. If they enjoy apple slices, suggest parents sprinkle cardamom on them instead of cinnamon. If serving sweet potato fries, encourage the children to choose a different spice-herb combination to sprinkle their fries with. • Add unfamiliar healthful foods to dishes kids already like. Experts say it often takes introducing a new food as many as 15 to 20 times before children begin to accept and like it.28 They speculate that it takes this long for children’s taste buds to get used to a new plant food, so encourage clients not to give up when their children reject a new food a few times. Instead, suggest they add new healthful foods to what their kids already enjoy. For example, if kids like tomato sauce but not sweet potatoes or pumpkin, parents can purée these items in small amounts and add them to the sauce. Or if they love rice and slivered almonds but don’t like dried fruit, parents can make a rice dish that includes almonds and chopped dried apricots. • Encourage parents to set a good example. When children see their parents eating and enjoying plant foods, they’re more inclined to do the same. Suggest parents eat salads, add vegetables to omelets, or have veggies and hummus for a snack so their children can see them eating such foods. Plant foods that aren’t as popular but taste great and are easy to prepare in a bind include jarred artichokes, roasted bell peppers, and marinated button mushrooms. 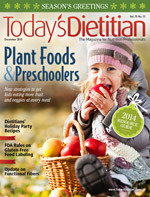 Encouraging children to eat more plant foods doesn’t have to be a challenge for clients. With the wide variety of fruits, vegetables, whole grains, and legumes available, there are plenty of options from which to choose and ways to prepare them. Often, all it takes is a little creativity, ingenuity, and willingness to try new foods and recipes. — Melissa Halas-Liang, MA, RD, CDE, is founder of SuperKidsNutrition.com, a website that provides nutrition workshops and curriculum plus online resources for thousands of school partners in 40 states. She’s also creator of the Super Crew kids, a group of superheroes who get their powers from healthful colorful foods that inspire kids and families to live their healthiest lives. • Healthy Kids Today, Prevent Cancer Tomorrow campaign: This campaign provides toolkits with recipes, activities, and behavioral trackers to help families, kids, and educators make healthful eating and fitness fun. For more information, visit www.superkidsnutrition.com/healthykids or www.aicr.org/healthykids. • Meatless Monday: On average, Americans consume 8 oz of meat per day—45% more than the USDA recommends. The goal of this campaign is to reduce meat consumption by 15% for both personal and planetary health. For more information, visit www.meatlessmonday.com. • Let’s Move! : This campaign offers parents and caregivers tools, support, and up-to-date nutrition information so they can make more healthful choices while also instilling healthful eating habits in their children. For more information, visit www.letsmove.gov/eat-healthy. • Vegetarian Nutrition Dietetics Practice Group: This practice group strives to empower members to be an authority on evidence-based vegetarian nutrition for food and nutrition professionals, health care practitioners, and the public. Its aim is to optimize global health and well-being by creating and disseminating vegetarian nutrition education materials, supporting cutting-edge research, and developing influential public policy. For more information, visit http://vndpg.org. 1. Open canned beans and canned corn. Over the sink, empty both cans into a strainer and rinse thoroughly. Let water drain from strainer. 2. Put the beans and corn into a large salad bowl. Add chopped bell pepper, carrot, olive oil, and salsa. 3. Mix together with a large spoon and serve. 2. Drain garbanzo beans, place into a colander, and let dry. After they dry, place garbanzo beans in a medium bowl. 3. Drizzle olive oil and sprinkle spices over beans and mix well. Pour beans onto baking sheet and bake for 40 minutes, occasionally removing sheet to stir. Let cool and then serve. 1. Campbell TM, Campbell TC. The breadth of evidence favoring a whole foods, plant-based diet, part I: metabolic diseases and diseases of aging. Primary Care Rep. 2012;18(2):13-23. 3. Godfrey KM, Sheppard A, Gluckman PD, et al. Epigenetic gene promoter methylation at birth is associated with child’s later adiposity. Diabetes. 2011;60(5):1528-1534. 4. Zeisel SH. Epigenetic mechanisms for nutrition determinants of later health outcomes. Am J Clin Nutr. 2009;89(5):1488S-1493S. 5. Lillycrop KA, Burdge GC. Epigenetic mechanisms linking early nutrition to long term health. Best Pract Res Clin Endocrinol Metab. 2012;26(5):667-676. 6. Barclay AW, Petocz P, McMillan-Price J, et al. Glycemic index, glycemic load, and chronic disease risk — a meta-analysis of observational studies. Am J Clin Nutr. 2008;87(3):627-637. 7. Basaranoglu M, Basaranoglu G, Sabuncu T, Sentürk H. Fructose as a key player in the development of fatty liver disease. World J Gastroenterol. 2013;19(8):1166-1172. 8. Crowe KM, Francis C; Academy of Nutrition and Dietetics. Position of the Academy of Nutrition and Dietetics: functional foods. J Acad Nutr Diet. 2013;113(8):1096-1103. 9. Snellen EL, Verbeek AL, Van Den Hoogen GW, Cruysberg JR, Hoyng CB. Neovascular age-related macular degeneration and its relationship to antioxidant intake. Acta Ophthalmol Scand. 2002;80(4):368-371. 10. Carotenoids: alpha-carotene, beta-carotene, beta-cryptoxanthin, lycopene, lutein, and zeaxanthin. Linus Pauling Institute website. http://lpi.oregonstate.edu/infocenter/phytochemicals/carotenoids/ - armd. December 2005. Updated June 2009. Accessed September 11, 2013. 11. Rao AV, Sung MK. Saponins as anticarcinogens. J Nutr. 1995;125(3 Suppl):717S-724S. 12. Liu W, Lu X, He G, et al. Cytosolic protection against ultraviolet induced DNA damage by blueberry anthocyanins and anthocyanidins in hepatocarcinoma HepG2 cells. Biotechnol Lett. 2013;35(4):491-498. 13. Bae JY, Lim SS, Kim SJ, et al. Bog blueberry anthocyanins alleviate photoaging in ultraviolet-B irradiation-induced human dermal fibroblasts. Mol Nutr Food Res. 2009;53(6):726-738. 14. Dinkova-Kostova AT. Phytochemicals as protectors against ultraviolet radiation: versatility of effects and mechanisms. Planta Med. 2008;74(13):1548-1559. 15. Poljsak B. Strategies for reducing or preventing the generation of oxidative stress. Oxid Med Cell Longev. 2011;2011:194586. 16. Ninfali P, Mea G, Giorgini S, Rocchi M, Bacchiocca M. Antioxidant capacity of vegetables, spices and dressings relevant to nutrition. Br J Nutr. 2005;93(2):257-266. 17. Shan B, Cai YZ, Sun M, Corke H. Antioxidant capacity of 26 spice extracts and characterization of their phenolic constituents. J Agric Food Chem. 2005;53(20):7749-7759. 18. Gemen R, de Vries JF, Slavin JL. Relationship between molecular structure of cereal dietary fiber and health effects: focus on glucose/insulin response and gut health. Nutr Rev. 2011;69(1):22-33. 19. Trock B, Lanza E, Greenwald P. Dietary fiber, vegetables, and colon cancer: critical review and meta-analyses of the epidemiologic evidence. J Natl Cancer Inst. 1990;82(8):650-661. 20. Burton-Freeman B. Dietary fiber and energy regulation. J Nutr. 2000;130(2S Suppl):272S-275S. 21. Haber GB, Heaton KW, Murphy D, Burroughs LF. Depletion and disruption of dietary fibre. Effects on satiety, plasma-glucose, and serum-insulin. Lancet. 1977;2(8040):679-682. 22. Mahoney CR, Taylor HA, Kanarek RB, Samuel P. Effect of breakfast composition on cognitive processes in elementary school children. Physiol Behav. 2005;85(5):635-645. 23. Institute of Medicine. Dietary Reference Intakes for Energy, Carbohydrate, Fiber, Fat, Fatty Acids, Cholesterol, Protein, and Amino Acids (Macronutrients). Washington, D.C.: National Academy Press; 2002. 24. Vitamin and Mineral Supplemental Fact Sheets. Office of Dietary Supplements, National Institutes for Health. http://ods.od.nih.gov/factsheets/list-VitaminsMinerals/. Accessed October 30, 2013. 25. US Department of Agriculture. How to Buy Canned and Frozen Vegetables. Home and Garden Bulletin 259. http://www.ams.usda.gov/AMSv1.0/getfile?dDocName=STELDEV3103622. 1994. 27. Savage JS, Peterson J, Marini M, Bordi Jr PL, Birch LL. The addition of a plain or herb-flavored reduced-fat dip is associated with improved preschoolers’ intake of vegetables. J Acad Nutr Diet. 2013. 28. The picky eater. Ellyn Satter Institute website. http://ellynsatterinstitute.org/htf/thepickyeater.php. 2013.